Third time lucky as they say. I had this update ready to go last September, shortly after iOS 8 launched but Apple rejected it. With a few visual tweaks to make the reviewers happy and a few other functional changes. 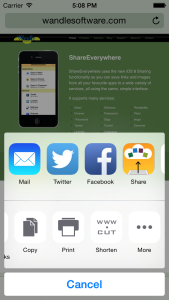 www.cut 3.3 should now be available on the App Store. The one line summary: this is the iOS 8 update for www.cut. I’ve made a few small tweaks to the UI but the most visible change is the addition of an extension so you don’t need to mess with the URL scheme. Steps two to five only need to be done once. Internally I’ve updated to a newer version of the Bit.ly API. Existing users will have to log in again, this time using their username and password rather than going through the palaver of finding their API key. I’ve also taken the opportunity to modernise some of the code, though no Swift just yet! It’s available on the App Store now.